Ideally one would require Microsoft Project software installed on the computer in order to open and view Microsoft Project (.mpp) files. We have already seen alternative free MOOS Project viewer software to open Microsoft Project files without the need of original Microsoft Project application software. If you only intend to open and view Microsoft Project file content, you can also do it online within web browser at AmiProject without need to install any software. 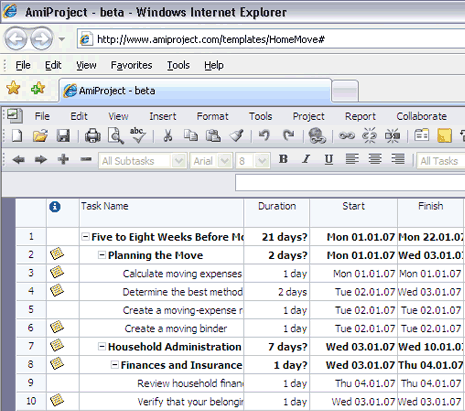 AmiProject is an online viewer for Microsoft Project (.mpp) files. It has very similar interface to actual Microsoft Project software and works fine opening of Microsoft Project 2007, 2003 and 2002 files. It also supports: Gantt Chart view, task information window with all details about tasks, resizable columns and movable table/chart splitter. How to check the version of Microsft Project file? This allows me to continue using Microsoft Project as my project management tool of choice, while give my team members a easy browser access to publish, execute and control projects in real time. ValleySpeak Project Server is a companion program that works with Microsoft Project client. ValleySpeak Project Server enables online collaboration between project managers, team members, Executives and other stakeholders. ValleySpeak Project Server also enables your company to share standards across projects, view resource availability and other resource information across projects, and manage and report on portfolios of projects. ValleySpeak Project Server allows the Project Managers to use Microsoft Project as a Managing tools in real time. It enables me to view and share the Microsoft Project schedules with team members in real time It lets me continue to use for managing your schedules and projects and at the same time it is easy to use and have access to the web based browser. It lets me to update the schedules through the browser. As the server uses the native Microsoft Project file, I can report the task in real time. AmiProject is really simple and stright forward tool for online viewing of MS Project file formats. Ganttzilla provides more PM – related functionality like versioning, tracking, integrated templates library for project plans.